The acting director of the top ethics watchdog in the federal government has raised questions about a number of actions by embattled Environmental Protection Agency Administrator Scott Pruitt. 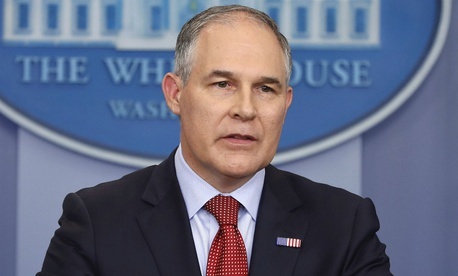 In a letter to EPA ethics official Kevin Minoli, first obtained by The New York Times, David Apol, acting director and general counsel of the Office of Government Ethics, expressed concerns regarding Pruitt’s $50 per night rental of a Capitol Hill condo owned by the wife of a lobbyist with business before the agency, his travel at taxpayer expense and other issues. Apol, appointed acting director of OGE outside of the normal chain of succession after Walter Shaub’s resignation last year, questioned the process by which Pruitt received clearance from EPA ethics officials for a six-month rental of a Capitol Hill condo co-owned by the wife of J. Steven Hart, chairman of Williams and Jensen, a lobbying firm that represents several clients that fall under the agency’s jurisdiction. Last week, Minoli walked back his earlier approval of the rental agreement, noting that his analysis was based solely on the text of the rental agreement, and not what actually took place after the lease was signed. Although Pruitt claimed only to have access to one room in the two-bedroom condo, his daughter reportedly stayed in the second bedroom rent-free while she was a White House intern. Additionally, Apol raised concerns about some aspects of Pruitt’s taxpayer-funded first class travel and security arrangements, a controversy that has dogged the EPA administrator since last year. Apol’s harshest words came with regard to reports in The New York Times that agency leadership retaliated against at least five officials who questioned Pruitt’s actions. Apol stressed that Minoli must properly address these issues, and address any violations. He did not mention allegations last week that Pruitt circumvented the White House by using an obscure provision of the 1996 Safe Drinking Water Act to grant substantial pay increases to two of his closest aides. Pruitt denied knowledge of the raises and said he reversed them upon finding out. The letter comes amid growing bipartisan complaints over Pruitt’s conduct. On Sunday, Sen. Susan Collins, R-Maine, told CNN that she thought the administrator was the “wrong person” to lead the agency. Meanwhile, Trump appeared determined to protect Pruitt over the weekend, attempting to put the controversies in a more positive light in a Tweet Saturday.